Happy Friday! Did you have a good month? Can you believe that a new month starts on Monday? I feel like I say this every month, but September went by so quickly, especially the past two weeks. How’s the weather by you? We’ve had a few days of “Fall” weather, but nothing permanent yet. I hope that changes soon! As usual, I have a lot to say or “runfess” about September. 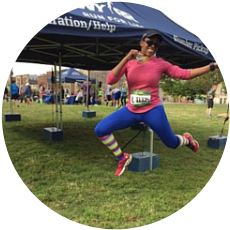 Since it’s the last Friday of the month, I’m linking up with Marcia from Marcia’s Healthy Slice for Runfessions. Let’s get started! I runfess that some people on airplanes baffle me! I’m not a huge fan of flying, so I understand the need to want to get on and off the plane as soon as possible. That being said, there’s absolutely NO reason to get up as soon as the plane has landed and reached the gate. As soon as the seatbelt sign goes off, everyone wants to jump up – WHY?! I often want to ask these people “Where are you going”? Just wait until it’s your turn to exit your row instead of standing directly in the row and blocking people. It’s one of my biggest pet peeves when it comes to flying! I’ve been dealing with some hip pain on my runs (anything longer than 3 miles). This is starting to annoy me because I have several races coming up this Fall. In order to hopefully get better soon, I’ve been doing a ton of PT exercises, stretching and foam rolling. I also haven’t been running during the week so that I can focus on those 3 things, although I’m still doing strength training. Fingers crossed that my run on Saturday is okay. This Dawson’s Creek meme never gets old! I runfess that I still need to get the Run Fast, Cook Fast, Eat Slow Cookbook! I feel like I’m the only person that doesn’t have this cook book yet! I do have the original Run Fast, Eat Slow cookbook and love it. Part of my wants to get through some more recipes in that cookbook before I buy the new one, but the other part of me has FOMO and I want to see all the new recipes. My friends and family always ask me what I want for Christmas, so maybe I won’t buy it just yet but I’ll add it to my wishlist. If you have this cookbook, how do you like it so far? As a follow up from my August Runfessions, I’m about 80% sure that I want to run another marathon. Once I get this pesky hip under control, I think I’ll be in a better mindset to start training for a marathon again. Rock n Roll New Orleans in February is starting to look very appealing to me. It would be nice to run a marathon and then eat my weight in beignets hahahaha. If you’ve done this race, any feedback to share? Or even if you know of any good marathons that take place in January, February or March – I’d love to hear your thoughts! So I’ve been having a love affair with cauliflower for the past few months. While I’m not a fan of the cauliflower crust pizza, I really enjoy it in all other forms – steamed, roasted, sauteed, with buffalo sauce, etc. Also it’s so easy to cook in the air fryer that I could have it every day if I wanted too. Now sometimes it doesn’t exactly love me back (tummy problems) but I don’t care because it’s just so tasty! Do you have a vegetable that you absolutely love? I’d love to find the purple and green cauliflower! Do you have anything you want to runfess for September? I hate flying and people baffle me as well! I could match your first 2 runfessions. We have been flying a bunch lately, and people’s airplane behavior is sometimes weird. My hip is also being a jerk. I have the “Run Fast Eat Slow” book. It was given to me by a friend for Christmas last year. I runfess, I have not cooked any of the recipes yet! Oh yeah totally agree. People’s behavior on the airplane always baffles me. I just really don’t get it! Whenever you decide to try a recipe from the book, make the superhero muffins. They are so good! I’m so sorry to hear about your hip still hurting. I hope it calms down soon. I’m with you on the flying–I don’t mind people standing up to disembark as long as they play nice and let people out in an orderly fashion. Thanks Wendy. I’m keeping my fingers crossed that tomorrow’s run goes better than last week. I hope your hips calm down so you can pull the trigger on that marathon. I’d love to run NOLA. Flying out of here in February weather has been holding me back from committing to it. Yup, I can totally relate to that. The weather can be so crazy in the winter. Heck, I’m nervous about flying to San Antonio in December! That green cauliflower is gorgeous and could go into a floral arrangement! Until I make something from the first Run Fast cookbook, I just can’t buy the second one… If you have the first one, please recommend some of your favorite recipes. For the first cookbook, I definitely recommend the superhero muffins. Michelle just mentioned doing intervals too. I’m going to try that tomorrow and see what happens. You are not the only one that does not have that cook book. I don’t have it either but I really dont have any desire to get it / read it. LOL, exactly. Or if they have a connection to catch, maybe try to get a seat more toward the front of the plane if possible. Ummmm…I do not have either of the Run Fast cookbooks, so there’s that LOL NOLA has been on my radar forever, but I’m not too keen on training through the winter for it (the full marathon, that is). And, total agreement on airline travel. My pet peeve is the reclining seat…seriously? How does reclining 3-4 inches back make any difference on your comfort? Those of us with long legs are not enjoying the ride! Yeah I feel the same way about the reclining seat. I never recline my seat because I try to be courteous to the person behind me. I runfess that I have the Run Fast, Cook Fast, Eat Slow cookbook and I haven’t tried a single recipe! It’s beautiful though, and the recipes sound delicious. You really need to check out Fascial Stretch Therapy for your hip. FST is a different kind of stretching and it starts with the concept that everything is connected, so that your hip problem may (probably is) starting from and connected with something else that is out of balance in your body. It’s pain free and pretty amazing. I’ve heard that the cookbook has a ton of great recipes! I will definitely look up the Fascial Stretch Therapy for my hip. Thanks for the recommendation. I don’t jump up, but I do step into the aisle so I can stand up. Those airplane seats aren’t comfortable, and after a few hours, I need to get up and stretch. I just got Run Fast Cook Fat Eat Slow. I’d been thinking about it for Christmas, and then decided I wanted it before then. I have other Christmas ideas so I didn’t feel guilty about taking it off my list. That I can totally understand, but I’m talking more about the people that hump up, grab their luggage and then block other people from getting out, lol. You know how I feel about people behaving badly on airplanes! LOL! I’m sorry your hip’s still acting up – run/walk intervals are still the only way I can get my miles done at the moment. I hope you get some relief soon! I have been dying to run NOLA – it’s just always been questionable about flying out of Boston in February. You may motivate me if you decide to register. I think I’ll have to go back to those consistent run/walk intervals and see how that feels. I did run/walk intervals after my surgery when I was coming back to running and it really helped. I will definitely let you know about NOLA! I’m also a little scared about flying out in the winter, but winter is probably the only good time to run a race in NOLA because of their crazy heat and humidity in the summer. I have that cookbook. I runfess..I have not made anything from it. Do NYC in 2019. I need someone to get me through my FIRST. Hope your hip problems go away. Oh wow, are you planning on doing NYC next year? That’s awesome! I runfess that we must be twins – these all apply to me too! The people on the plane back from Amsterdam were TERRIBLE. And I need the cookbook too although I am secretly hoping I will meet Elyse again when she comes to Chicago for the marathon and that she’ll give me a copy and we’ll become BFFs. Goals. LOL! I don’t understand why people do not act nice on airplanes – it’s so crazy to me! I like your idea of meeting Elyse when she’s in Chicago next weekend! I thought the original RFES recipes were too complicated so I hope the new one might work better for me. I might put it on my Christmas list too. I really hope your hip quiets down soon. That makes sense if you’re in the front. On Thursday I literally saw someone run down the aisle all the way from the back row. I was just looking at her in disbelief lol. The hip has quieted down a little bit so I’m thankful for that. I hope your hip cooperates today! If it doesn’t , it’s probably time to see someone about it. Oh dear, I AM one of those people on planes. For me it’s mostly I’ve bern sitting for hours, but then again, I actually believe you do deplane quicker that way — we almost always have a connection to make, btw — the people who stay seated? They’re the ones who usually take their sweet time getting their stuff & block everyone. Love cauliflower. Obsessed with TJs cauliflower gnocchi, but I do enjoy plain cauliflower too. I’ve had the purple & green varieties. The hip quieted down a little but today. There was still discomfort but not nearly as much as last week so I was happy for that! Oh I love TJs cauliflower gnocchi! You actually just reminded me that I have a bag in the freezer! I’m totally obsessed with cauliflower too and I have tried the different colors, they are great! I did get the Run Fast Eat Slow cookbook and LOVE it!!! I really hope I can find the different colored cauliflower in my supermarkets this Fall! I haven’r run RnR NOLA, but have a few friends that run it every year and love it! Seems to have a real ‘party’ atmosphere. Tricia has done the half several times… not sure her blog is still up but if it is you could read her recaps. Hope that hip plays nice for you! Great idea to look at Tricia’s blog – I’m going to do that now! I agree that it seems to have a party atmosphere for the race. I went to NOLA for the first time in June and it was so much fun! People flying baffle me as well! I also don’t understand why people stand up so quickly and block the aisle! Everyone will get off in proper time! I have the new cookbook (got it for my birthday). I still need to actually use a recipe, but everything looks so good so far! I love cauliflower, but tried purple for the first time the other day! Thanks Esther! My hip is slowly feeling better so I’m hopeful that I can still do my Fall races. So cool that you tried the purple cauliflower recently! I love all the brassicas and the ones I have in my garden grow really well here…I need to try growing cauliflower! That green one is Romanesco – I can never remember if it’s a variety of cauliflower or a close relative. oh that would be awesome if you could grow your own cauliflower – I wish I could! Hooray for cauliflower! I only discovered that purple cauliflower existed a couple years back, but it’s so pretty! es the purple cauliflower almost looks too pretty to eat! You’re not the only person who doesn’t have the cookbook. I don’t even have the first one, lol.